Now as you can personally attest to, I've got No.1 covered. So the last couple of days I worked on number 2 instead. The nice guys at ellak.gr organized the 3rd FLOSS conference and since it took place very close to where I work, I took the opportunity to avoid working meet some old friends and make some new ones. Number One of course, is Wietse Venema. Since his work was an inspiration for me to pursue a PhD in computer security, I just had to see him in person once. He was more fun that I expected, to be honest. Security guys have a reputation of being a wee bit paranoid and itsy-bitsy abrupt on normal people, not to mention complete strangers. Wietse however was neither. This probably has to do with his academic background or maybe the fact that he is Dutch, who knows. 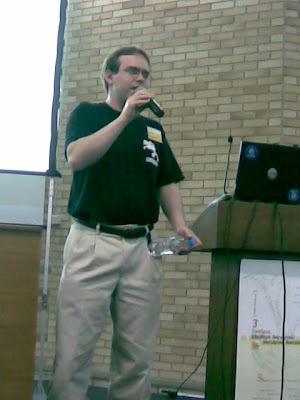 He proved to be a warm, funny guy instead, who runs FreeBSD on his laptop (that always shows character in my book). His talk was about Open Source and Security, both matters dear to my heart. The discussion of Postfix was a walk down memory lane for me. I can still remember the excitement around its initial release: "Hooray! No more sendmail exploits!". Wietse briefly discussed the architecture of postfix and how it relates to its security. He also showed some statistics comparing postfix to sendmail and qmail that I had seen in the past, but was curious to where everyone currently stands. Apparently postfix holds the second place in number of deployments (good), the first in number of lines of code (bad), but that is caused by having reached sendmail's feature list, without compromising the original architectural goals (good). For the problem of security at large, the most provocative suggestion was to make software development too hard for the laymen, so only experts could do it. Heh. As John Wayne so eloquently used to put it: "that'll be the day". Lots of comparisons were presented in the talk by Diomidis Spinellis, titled A Tale of Four Kernels. The talk covered a code quality comparison of four major commercial and open-source operating systems, Windows, Solaris, Linux and FreeBSD. 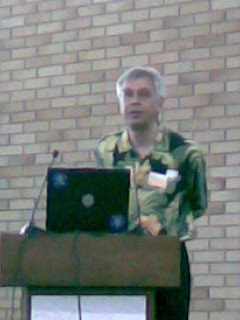 Diomidis is a well known author and FreeBSD commiter, and that was evident in the quality of his work and presentation. The room was packed, and the Q&A session lasted almost as long as the presentation itself. I suppose the sensitivity of the subject had something to do with it. Diomidis went through heaps of information so fast you could barely comprehend each slide, unless you had the forethought to study his paper before the conference, like your truly did. Although he was very delicate in his conclusions, stating that all systems had comparable quality, there were some members of the audience that seemed to have already made up their minds and didn't care for diplomacy. Another great talk was by Jim Blandy. The talk was about Open Source Infrastructure for Software Development, which covered the evolution of version control systems (VCS), from SCCS, to the recent crop of distributed VCS. Being one of the people who gave us CVS and Subversion, his recollection of the history of this area was very exciting. Besides sharing some colorful historical tidbits, he also gave a meaningful comparison of the algorithms and data structures used by the various systems. He gave high marks to Subversion for being a fine choice in a centralized organization structure, but eloquently presented the fundamental paradigm shift that distributed VCS present. He said (as best as I can remember) that controlling access to the commit step (what all centralized VCS do) is the wrong (worst?) place to do it, since adding a change is not that big a deal. Instead the point of merging is what should be guarded, since that is when another changeset gets incorporated in our code. The fact that distributed VCS replicate whole repositories, not just working copies, makes allowing commits a natural thing, while making merge selection part of the release engineering process. I've read many pro-distributed-VCS arguments, but I found Jim's focus on the social aspect of the merge process a refreshing one. Luckily, most of my cohorts were present in this talk, so switching our team to Mercurial might not be just a dream after all. All in all, the conference was quite an enjoyable experience. Old friends, new friends, free food, stimulating discussions, what's more to ask? What? To be on TV? Hey, that's easy. You just have to hang outside the main conference room chatting with random people, until you notice a cameraman and a journalist taking interviews from conference organizers and speakers. Then you make sure to be in the camera frame and voilà! You've got your 3 seconds of fame.